Norwegian Polar Institute polar bear biologist Magnus Andersen reports on the spring 2011 polar bear field season on Svalbard. We are on board on the Norwegian coast guard vessel KV Svalbard, where we will work on polar bears for the next ten days alongside other researchers that mainly study sea ice. We will sail north tomorrow, but today we have been flying locally in Isfjorden, the largest fjord on the west coast of Spitsbergen, the largest island of Svalbard. Longyearbyen, the main settlement in Svalbard, with more than 2000 inhabitants, is located in the southern part of the fjord. Most bears are found in the northern part, and we started in the evening searching for bears in this area. There was not much to see, before we finally saw some tracks and spotted an adult female with a small cub. This was something of a surprise, as Isfjorden is not known as a place where polar bears den. Last spring, for the first time, we encountered a female with a cub a bit further west in the fjord, but the cub was so big that they could have walked from another area. This cub however, was still grayish in colour, as they usually are in the first days after leaving a den, and it was small - only 9kg. Furthermore, the mother had a collar that had transmitted the first positions for the spring just a couple of days before, in the place we encountered them. 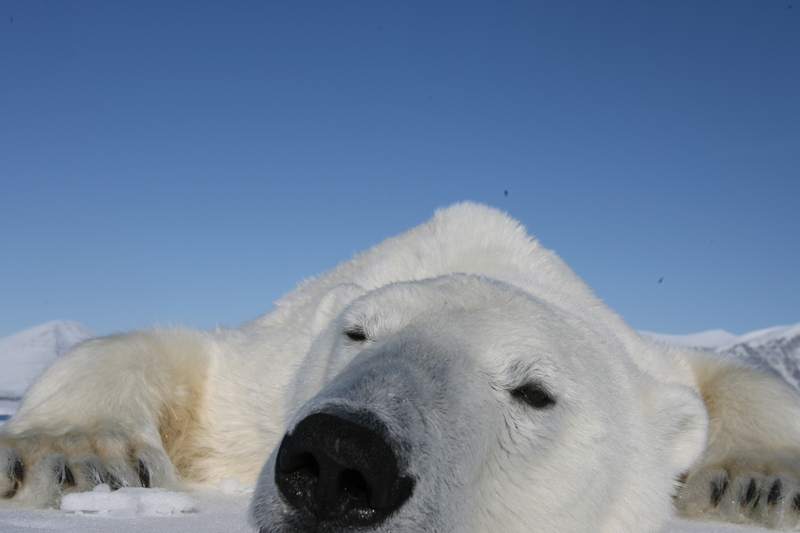 When polar bears were intensively hunted from 1870 to 1972, the bears in the fjords on the west coast of Spitsbergen likely got shot frequently, as there was large human activity in those areas. It may be that this is the sign of a local increase in bear numbers in these fjords, after 40 years of protection. The mother was in good condition, weighting185kg, and this was her first cub, at the age of 6 years. She was marked in 2009 on the northern side of Spitsbergen, but recaptured last year not far from where we captured her today. 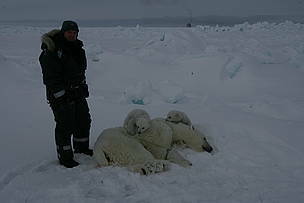 She had killed a ringed seal on the ice recently, a very good start for her and the cub, as it is critical to find something to eat after half a year without food, with the high cost of producing milk with a very high fat content. 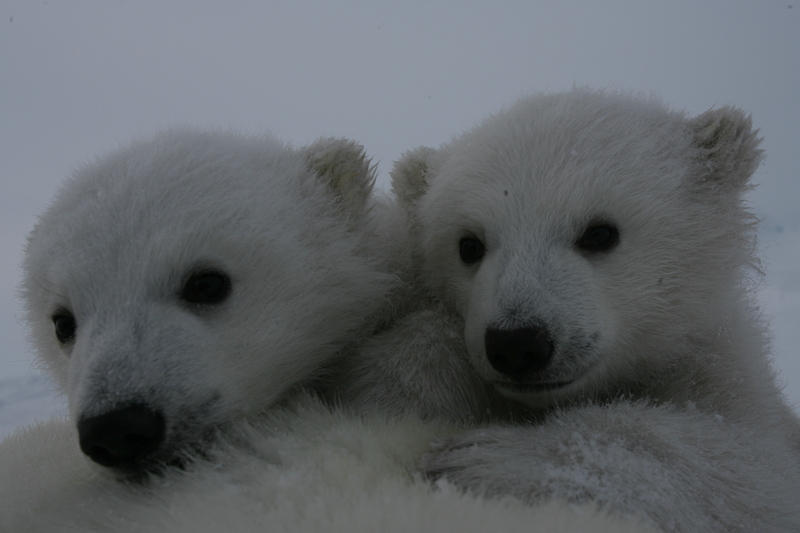 Many cubs die the first months in spring, most likely of starvation. We wish this one all the best of luck. After a couple of days with mediocre weather, it was partly sunny today, and we started to search for bears in Raudfjorden, a very scenic part of Svalbard in the north-west corner of Spitsbergen, with high peaked mountains (the type of mountains that gave the name to the island when the whalers arrived a few hundred years ago). We encountered some tracks from a female with two small cubs, but they went up on a glacier and then disappeared. A bit later we encountered a pair, the male not being much bigger than the female. It turned out that the female was a bear we marked as a yearling in 2005, now 6 years old. The male was only about 4 years old, but maybe with the lack of any larger males around, he may stand some chance. At only 157 kg, he was less than half the body weight of a typical male vying for the attentions of adult females. Further out in Raudfjorden, just after noon, we found a female with two two-year old juveniles. At this time, the cubs are about to go out on their own, the mother being ready to mate again. 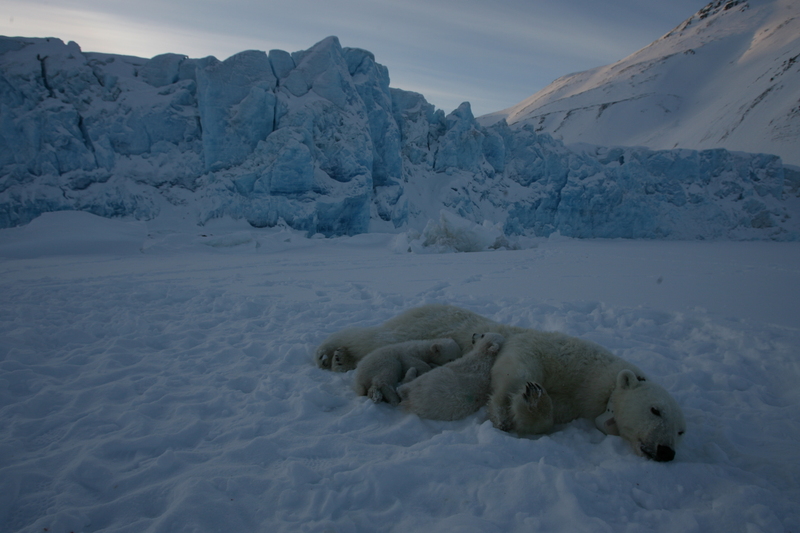 This family were captured together here in the same small fjord in 2009, so the cubs were likely born there. We then marked a subadult bear about three years old, before we searched the inner part of the next fjord, Liefdefjorden, in the front of a glacier, connected to the glacier in Raudfjorden where we saw the tracks disappear from the family earlier today. Then - bingo, we saw the tracks come down from the mountainside above the glacier, and there just at the glacier we found the mother and her two female cubs. 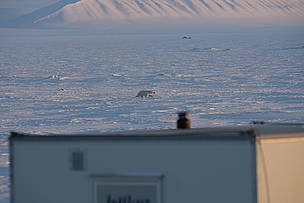 The female, N23831, has also previously been followed through the WWF-Canon Polar Bear Tracker. She was first marked in 2006 in Liefdefjorden and recaptured in Raudfjorden in 2005 and 2006, and is now 9 years old. We gave her a new collar. We sailed into Rijpfjorden, on the northern side of the most northern of the larger islands in Svalbard, this morning. The area has colder water than western and northern Spitsbergen, and it is not often we are able to get to this area in spring, due to heavy ice. But the coast guard are the right people to get us there, as their boat breaks through most of the sea ice it encounters. After noon good weather meant the helicopter could fly,. Just before that, we had spotted a female about once nautical mile away from the ship. It turned out she had two small cubs, a 9kg male and a 10kg female. We gave the mother a collar. We have not collared that many females in this area so it will be particularly interesting to follow her movements. Some time later in the evening, we also encountered an old female in the same area, and we gave her a collar too around her neck. The fog came in and we had to hurry back to the boat. A small helicopter is very dependent on good visibility in the Arctic. Back on the ship, it was time for some food. Five days ago, we moved from KV Svalbard, the coast guard ship, to two small cabins in the field, on Barentsøya, in the middle of the Svalbard archipelago. Some days of bad weather were used to get everything in order, but today we were out marking bears again. It is very much like this in the field: when the weather is nice we have long days and work with a handful of bears or more, but there are many days when we just stare out the window waiting for the weather to clear up. We have some reindeer and foxes around for company while waiting, and sometimes provocative bears passing by as if to say “we know you cannot fly today”. In the morning today, at some small islands in the south-west corner of Barentsøya where we almost always spot bears, we found three adults. Two of them were already known to us: an old male of about 20 years and a younger male. We also marked a female we estimated to be about 8 years old, that the two males were competing for. In the evening, we marked an older adult female with three newborn cubs – this amount of cubs is not very common. Despite the large litter, all the cubs looked very healthy, the smallest being more than 12kg. It is said that the smallest cub in a triplet litter has very poor odds to survive, but we have encountered a triplet with yearlings once, so we can hope. In the evening, we found an old female, about 20 years old, who had never been captured before. We fitted her with a satellite collar. The fact that she had not been captured before, and that we captured her in this area where we often work, indicatse she might be a ‘pelagic’ bear that mostly use more off-shore areas further away. Her satellite collar will tell us more. We arrived in Longyearbyen two days ago, and flew from the town today, south to the two fjords Van Miijen and Van Keulen, on the southern part of the west coast of Spitsbergen. Arriving in Van Keulen, it turned out that the fuel barrels we had there had tipped over, and were half covered by solid ice. We managed to get most of the fuel from a couple of them somehow, allowing us to continue the search for bears, after having a small lunch in the sun. It was a marvellous day, only just below freezing temperature and with very little wind. The inner part of Van Keulen, where we always used to encounter bears some years ago, was now completely covered with icebergs from a fast surging glacier. But at the new front, there were lot of tracks. Bears look for ringed seal lairs in the glacier fronts, where accumulated snow allow the seals to make their lairs, and where ringed seal pups are relatively easy prey in April. We marked a subadult male there, and tracked a female with small cubs for a while without finding them. In Van Miijenfjorden we had better success. We located a maternity den where a female with one cub had recently left. We did not find those bears, but instead spotted another mother with two small cubs. The mother was marked in 2008, then about 14 years old, and with a cub that still was alive last year when we recaptured them. Later in the evening, we caught another female, with known age of 5 years, as she was marked about at the same spot as a two-year old in 2008, together with her mother. Five is the age where females often mate for the first time in Svalbard, and maybe we will find her with her first litter next year. N23831, the female with two small cubs that we found in Liefdefjorden. She has previously been tracked on the WWF-Canon Polar Bear Tracker. 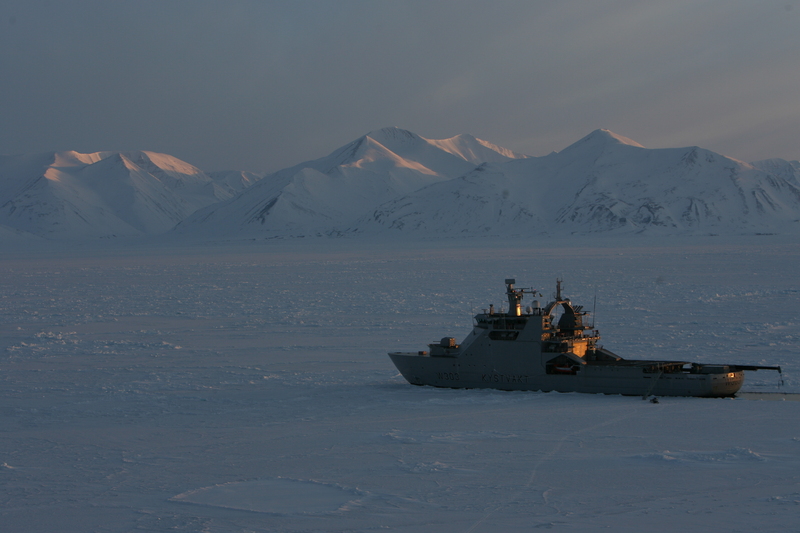 The Norwegian coast guard ship KV Svalbard, on which we were based during the first ten days in the field. Magnus Andersen of the Norwegian Polar Institute beside an adult female and her two small cubs. In the background is the coast guard ship KV Svalbard. A newly-collared female, passing our research camp the day after we marked her. A subadult male that we captured at the glacier front in Van Keulen, southwest Spitsbergen.